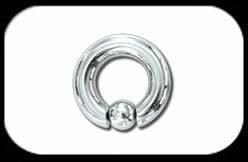 Ball Closure Ring / BCR 6mm/2ga in 316L Surgical Steel with clip in ball, removable by hand. Clip in ball BCR's are much easier to fit than a standard BCR but the ball is a less secure fit & may be more easily dislodged. Please bear this in mind when selecting which BCR is right for you.